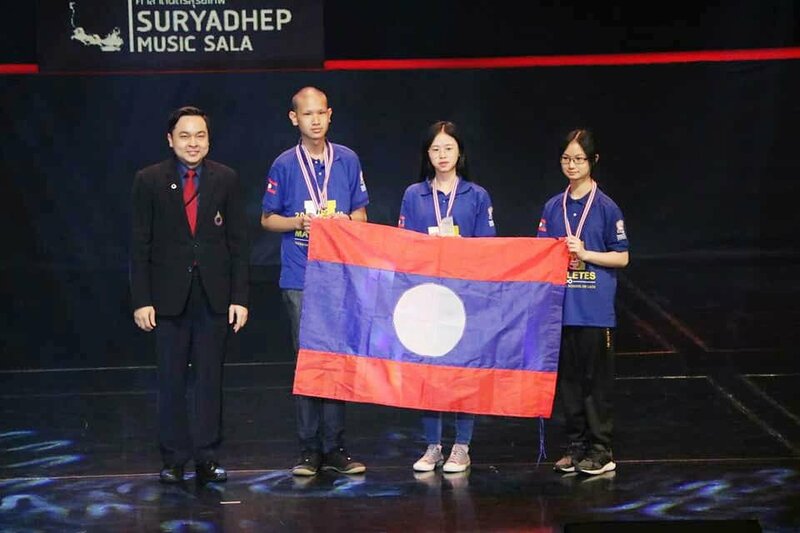 BANGKOK (Vientiane Times/ANN) - Some 21 students from the International School of Laos (formerly Eastern Star Schools) in Vientiane recently returned victorious after representing Laos at the 8th International Math Challenge and International Robot Challenge in Thailand. The competitions took place at Rangsit University, Bangkok, from March 8-12. Eighteen students competed in two categories of the 8th International Math Challenge, comprising the International Math Rounding Challenge and International Math Team Challenge. They came away with two gold medals, four silver medals, eight bronze medals, and four congratulations prizes from the rounding contest, and took third place in the math team contest, in which teams from 20 countries took part. The three other students took part in the International Robot Challenge where they came third among student teams from 10 countries. The students and their teachers returned to Vientiane last week to an enthusiastic welcome from the school’s board of administration, their parents and the media at Wattay International Airport. They said they were delighted to have represented Laos so successfully and were proud of their achievements. Their success not only put their own names in the spotlight but also those of their school and country, by raising the profile of Laos and its standard of education on the world stage. Mr Phonepaseuth Thammalath, who won a gold medal in the International Math Rounding Challenge, said he, his partners and his teacher considered their achievements to be an important prize both for themselves and for Laos. Miss Narinthone Sayamongkhounh, who won a silver medal, said she was very pleased to have represented Laos on the international stage. “We were very glad to take part in this event. This programme was very interesting and beneficial for all participants. We learned many things about mathematics and robotics. We also gained new experiences by travelling abroad and meeting people from other countries,” she said. The International Math Challenge and International Robot Challenge are organised annually for secondary school students. The International Math Challenge is held to demonstrate the challenges of mathematics and also encourages students to be motivated and disciplined to solve new problems, which requires a strong mathematics education and analytical thinking. The purpose of the maths challenge is to encourage students to improve their problem solving skills, and to enhance teachers’ professional development. This year, this annual competition brought together 60 schools, 250 teams, and 800 students from 20 countries. The International Robot Challenge is also held annually to nurture students’ creativity and interest in robotics, while promoting the role of engineering, coding and robotics in education. It give students the chance to develop 21st century skills like teamwork, social outreach, action research and problem solving. All competitions were conducted in English and were open to students from international, bilingual, and English programme schools. The organising committee hopes young people will be inspired to think critically and scientifically through a love of mathematics and technology. The event aimed to motivate students to see maths and robotics in a different light, stimulate their interest in these subjects, and think about how they can apply maths in their future studies and daily life.